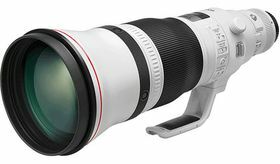 The world’s lightest 600mm f/4 lens,* delivering outstanding image quality and a polished professional performance. A five-stop Image Stabilizer lets you shoot handheld, letting you react more quickly. The EF 600mm f/4L IS III delivers ultra-high sharpness and very low levels of distortion. Fluorite lens elements reduce coloured fringing and boost resolution and contrast. An advanced optical formula not only boosts image quality, but also makes the EF 600mm f/4L IS III more portable, making it easier to use on location.